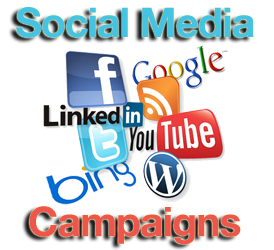 Social Media Marketing Campaigns are powered by our experience and relevant statistics. Our online marketing knowhow and our deep understanding of social media platforms generate social media marketing campaigns that produce tangible results. More importantly, we know what they can do for you. Social Media Marketing Campaigns are powered by our experience and relevant statistics. Our online marketing knowhow and our deep understanding of social media platforms generate social media marketing campaigns that produce tangible results.. It doesn’t take much to get started on Facebook Marketing Campaigns, Twitter Marketing Campaigns, LinkedIn Marketing Campaign or YouTube Marketing Campaign but it takes a lot of expertise and dedicated effort to produce excellent ROI. Peak Marketers’s social media marketing campaigns services are powered by savvy and statistics. Our years of marketing knowledge, mixed with the use of cutting-edge technology, and deep understanding of social channels generate social media marketing campaigns that produce tangible results. New media presents new opportunities: Social networking sites make it easy to use images, videos, games, mobile apps, and contests to engage your target market. Targeted marketing: We translate traditional marketing objectives into industry-leading social campaigns. It all starts with understanding what’s right for your business. 360° campaigns: We do them all. We do Facebook Marketing campaigns, Twitter Marketing campaigns, LinkedIn Marketing campaigns, YouTub Marketing campaigns, podcasting, social bookmarking, RSS, mobile apps, and web widget. Improves Search Engine Optimization SEO: Social media optimization produces better search placements, which means more views, customers, and sales. Enhanced Customer Relationship Management: Social media marketing campaigns allow you to connect with your customers and respond to their needs.. Better visibility: Facebook, Twitter, LinkedIn, YouTube and Pinterest are among the world’s most popular sites, generating millions of views every day.